If you carry extra fat in different areas of your body but are having a hard time shedding some of it through diet and exercise, it’s a good idea to think about other ways. Today, cutting-edge medical technologies allow easy removal of fat deposits in people who are looking for a more toned body. Liposculpture, which refers to any kind of fat removal procedures, including liposuction, lipomatic, and lipolysis, is a fast solution for you who want to get rid of unwanted fat in a short time. Liposculpture is a plastic surgery aimed at removing excess fat deposits in areas that are usually resistant to diet and exercise. Liposculpture is a more refined method of fat removal than liposuction which uses new technologies to target fat in areas that do not respond to exercise or diet. Liposculpture is a contouring procedure, that is to say it is best suited for removing small amounts of excess fat from different parts of the body to give it a good-looking shape. Thus, it is better to combine it with exercise and diet to get an optimal result. In a liposculpture procedure, a thin instrument called a micro cannula attached to an aspirator machine is utilized to dislodge fat from the concerned areas and suction it out. For the skin to be compressed on the underlying tissues, an elastic garment is then worn by the patient. What are candidates for liposculpture? You have an active lifestyle with regular exercise and healthy diet but are unhappy with some stubborn fat deposits in certain areas of your body. You are looking for an athletic appearance and toned body. You are after a less invasive and less painful procedure for contouring your body with faster healing and shorter recovery period. Generally speaking, any area of the body which has excess fat deposits and are resistant to non-surgical weight loss methods are candidates for a liposculpture procedure. Areas such as the chin and jowls, breasts, lower abdomen (spare tire), and hips (love handles) in men and the chin, abdomen (muffin top), inner and outer thighs, post-pregnancy fat, back, waist, and arms in women are potential targets of in this cosmetic procedure. Liposculpture of the hips, lower abdomen and back are more popular in women who are after an “hourglass figure”. It can also be combined with a fat transfer to the buttocks to achieve a more effective result. How is liposculpture different from liposuction? Liposculpture surgery is a technique for fat removal in a more controllable way. The instruments used in this procedure are smaller and the procedure is more delicate. While liposuction is a good method for removing large amounts of excess fat, liposculpture is for those who are after a more toned and athletic appearance. Liposculpture is carried out using a tumescent solution, which is used to make the body tissues solid, firm and expanded. This makes it easier for the surgeon to sculpt the body in a more controllable way. A cannula is then inserted through a small incision and the surgeon makes some movements with the instrument to dislodge certain fat and then suction it out via the suction device attached to the cannula. The tumescent liquid is also an anesthetic solution which infiltrates only to the areas to be reshaped. Liposculpture is performed under local anesthesia and a sedation is also given to make the procedure more comfortable for the patient. The whole procedure is usually very painless. You should not take any aspirin for six weeks prior to surgery. The only safe painkiller medication is paracetamol. You should also avoid taking vitamin E or Ginko Biloba for six weeks before procedure. As with any other cosmetic surgery, it is highly recommended to stop smoking for a few weeks prior to your liposculpture procedure because smoking negatively affects healing. Your body will be photographed before surgery to contrast it with your post-op body to see the difference and degree of improvement. You will be able to return back to work 3-6 days after surgery depending on your healing condition. Be sure to discuss your situation with your doctor as to when it is fine to resume normal activities. You will typically be able to resume your normal activities in one week but you should avoid strenuous activities for three weeks. After surgery, you may experience some fluid drainage from the incisions. You may be fitted in an elastic garment over the treated area for a few weeks to control swelling and to help your skin better fit its new contours. Your doctor may also prescribe antibiotic to prevent infection. Liposculpture is a comparatively safe procedure with few complications. Some potential side effects include: swelling, bruising, pain and scarring. If you choose a qualified and experienced surgeon the possibility of developing post-op complications will be greatly reduced. How may I apply for a liposculpture surgery in Iran? It’s as easy as a piece of cake. The only thing you need to do is contact AriaMedTour and put in your request. 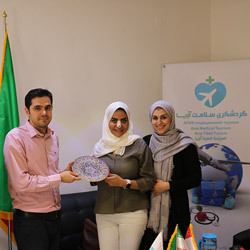 Our staff will immediately provide you with all information you need including the cost of your medical treatment and other travel costs, how to apply for a treatment, how many days you need to stay in Iran and so on. We will guide you through the whole process, from your decision to have the surgery until you fully recover from it. 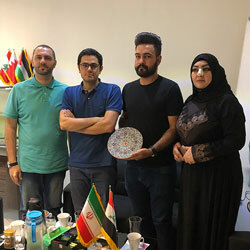 As soon as you make your decision to have a liposculpture in Iran, we will arrange everything for you including visa, hotel, doctor, hospital, and city transportation. Why is Iran ideal for liposculpture? 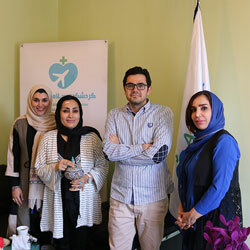 Generally speaking, plastic surgery practice in Iran has gained a lot of ground in recent years. The high demand for cosmetic treatments among Iranian people is a key factor for the great advancement of cosmetic surgery in the country. Low cost and high efficiency are the two main characteristics of plastic surgeries in Iran. Liposculpture is one of the cosmetic treatments that has become very popular over the last years. Iranian plastic surgeons are highly qualified and experienced in liposuction and liposculpture procedures, making use of the cutting-edge technologies to give patients the most desirable appearance. Apart from low cost and skilled doctors, well-equipped and well-staffed private hospitals and clinics in major Iranian cities must be key to your decision for a liposculpture in Iran. 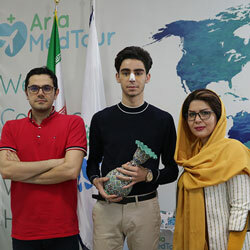 AriaMedTour hospitals and clinics are among the best in the country, offering the highest quality services to domestic and international patients. Friendly and caring nurses, and English and Arabic-speaking staff are all here to cater to your needs and expectations.